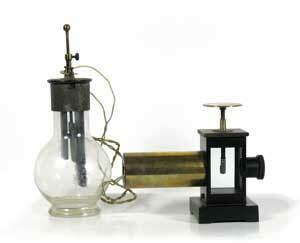 The first electroscope was a device called a versorium, developed in 1600 by William Gilbert (1544-1603), Physician to Queen Elisabeth I.. The versorium was simply a metal needle allowed to pivot freely on a pedestal. The metal would be attracted to charged bodies brought near. A simple hanging thread - called a "Pendulous thread" by Stephen Gray, (1666-1736) was introduced around 1731. The thread would be attracted to any electrified body nearby. 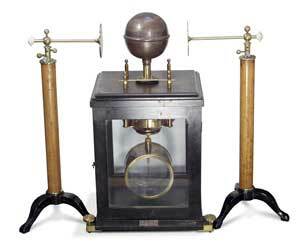 In 1753 John Canton improved the electroscope by adding two small pith balls suspended by fine linen thread. The upper ends of the threads were fastened inside a wooden box. When placed in the presence of a charged body, the two balls would become similarly charged, and since like charges repel, the balls would separate. The degree of separation was a rough indicator of the amount of charge. 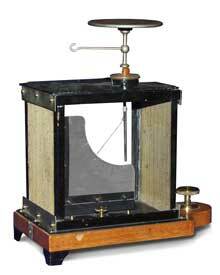 In 1770, William Henley developed the first portable quadrant electrometer. The date is sometimes referenced as 1772 since that was the first time the invention was published (phil trans 1772, 63, p. 359.) 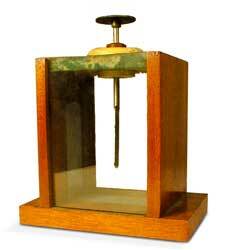 The device consisted of an insulated stem with an ivory or brass quadrant scale attached. A light rod or straw extended from the center of the arc, terminating in a pith ball which hung touching the brass base of the electrometer. When the brass was electrified the ball would move away from the base, producing an angle which could be read off of the scale. See illustration, below left. *I should point out that these distinctions are a modern construction; the 18th century authors referred to their simple string devices as electrometers. While not technically an electroscope, the device does indicate the presence of electric charge by rapid movement of the pith-balls inside the glass.